So taking the advice given to me I've decided to go back to the basics and work on shapes, perspectives, shading and light sources. Mountain Scene: Tried to add a light source(from the right) with rock/mountains and a few clouds. Iso shapes with light source: I'm very interested in Isometric Pixel Art so I worked on some basic shapes some with different bases. I also added some light sources to the shapes. I left the center line on the circle as just a guide for myself so I could picture the depth. Sword in the stone: So I wanted to try to do a sword with a light source and came up with this piece. I tried to make a realistic light source on the sword and stone thinking of a top right source with some shading. Block Head: With this piece I decided on doing a basic square with some facial features. Light source yet around from top right, with a shot at blending the shading. C&C very welcome. I'm trying to get a grasp on PA a long with the basics of light sources and shading. I appreciate tips given to me, but I am no expert in this art form, however I would love to learn the tricks of the trade to better my pieces. "Light source" doesn't means "just fade the color to left to right", you have to suggest the shape of the object (for example, the block head: it's a block, right? From the shading you tells it's a falt piece of paper). Summing things up you definitley need more contrast, and you should try to use colored outlines, instead of black ones. But this isn't really a lot of knowledge. You need to study! 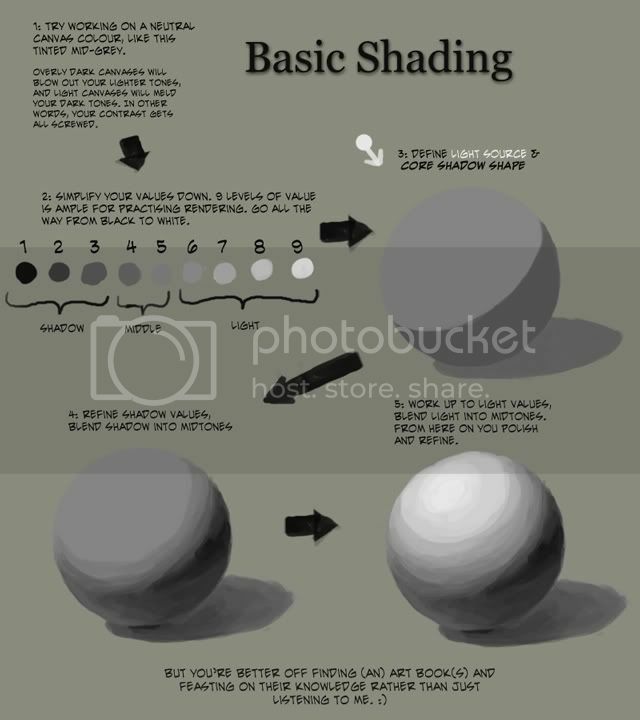 Find a bunch of art books that address drawing and shading. Pixel art is a very particular medium and makes practising art fundamentals all the more difficult. The best way to practise this stuff is with pencil and paper. You can show it in the OT Creativity thread and perhaps get some feedback. Also, avoid working in colour. It's a whole other mountain of theory you have to wrestle with (urgh unintentional pun because your mountain picture is in colour ). Think of it like learning to write: you have to learn each letter of the alphabet, then you have to learn how to put them together to make words, then you have to learn how to put words together to make sentences, etc etc. Think of art the same way. You first must learn line, then value, then form, then colour. Each step informs the next. You're trying to do them all at once, and ending up with flat values (low contrast) and no form (gradient-shading). Psi, I highly recommend you get yourself a sketchbook and some pencils and you work outside the pixel medium, doing pixelated mountains that are 32x32 pixels with no reference of any kind isn't exactly the best way to learn, I'm also willing to bet you're using a mouse. You need to work larger, others have said it much better than I, to be good at pixel art you must be good with the fundamentals of art, after all, pixel art is just a medium, it certainly won't magically make you better and in my opinion its worse to work in when you're trying to improve. I ask of you to not be like so many others I've warned, where they do not heed my warnings, for those people are still were they were a year, two years ago, still dishing out the same quality (or lack of, rather) of work. I won't name any specifics but it doesn't just happen here, it happens everywhere. Treat this like someone would like Eyecraft said, writing or perhaps playing piano, you can't just jump into this, I know art is fun but that doesn't mean its a bad thing to work a bit harder to get to a point to where you know what you're doing. I will tell you right now, if you really want to improve, seriously get a sketchbook, get some paper and draw as much still life as possible, learn about line, value, composition, color theory, proportions, anatomy. I wish you luck on your endeavors (if you choose to take them).